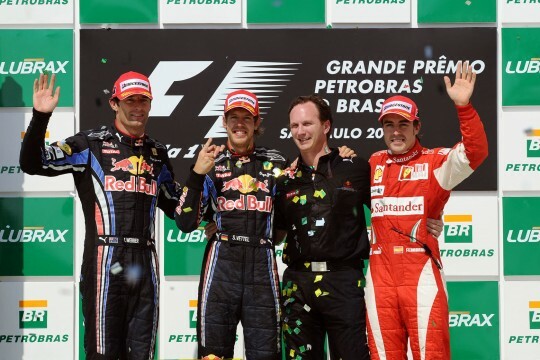 Until the very last lap of the Brazilian GP, I expected Sebastian Vettel to let Mark Webber past for the victory. The idea that Red Bull would allow Fernando Alonso to maintain a significant lead heading into the season finale at Abu Dhabi was astonishing to someone who came of age watching Ferrari tossing victories at Michael Schumacher. Let the two drivers race and what will be will be. if Alonso wins we will have been unlucky. I predict a Hollywood ending. Worst case scenario we don’t become champion? We’ll do it next year. But our philosophy stays the same because this is sport and it must remain sport. We don’t manipulate things like Ferrari do. Strong stuff. I suspect Mateschitz might even believe it. But he isn’t the guy running the team, and I don’t think the truth is as cut-and-dry as Red Bull is trying to spin it. As I discussed earlier this season, Red Bull’s team politics have been disastrous. Vettel was clearly the team’s number one driver, and Red Bull took some clear steps to favor him. Unfortunately, Vettel lost his position through disastrous misjudgments and Webber became a major championship contender. After Red Bull alienated Webber at Silverstone, and he replied by jamming Vettel at the start and then going on to a convincing victor, Red Bull had to stop favoring Vettel. There was no longer a plausible argument for explaining why he would get preferential treatment. Now, having been burned in their attempts to make Vettel into Michael Schumacher and Mark Webber into Rubens Barrichello, they’re forced to sit on their hands while these two drivers run the risk of throwing away the driver’s championship. But let’s be clear what happened: Vettel was shown far greater respect at Red Bull, and that translated into material aid at Silverstone. When Vettel squandered his advantages and Webber moved to the front, the team stopped favoring anybody. Heads Vettel wins, tails Webber loses. On the other hand, if Red Bull are sincere about their desire to let the championship be decided on the track, then it really does make for an impressive contrast with Ferrari, who maneuvered Fernando Alonso into this position by forcing Felipe Massa to yield the lead at Germany. Next week, three drivers have a credible shot at the championship. Had Alonso not been allowed past Massa, the drama would be even greater, with the three contenders all locked within a few points of one another. The longer I watch F1, the less of a Ferrari fan I am. In retrospect, I feel horrible about how Barrichello’s was wasted at Ferrari, and how shockingly little gratitude he was shown for his driving. If he had been allowed to challenge Schumacher behind the wheel of a Ferrari, I suspect Schumacher’s championship count might be slightly reduced. Now they’re doing the same thing to Felipe Massa, who fought his way into the number one spot at Ferrari by out-driving the temperamental Kimi Raikkonen only to have it taken away when Ferrari anointed Fernando Alonso as their primary. But if Ferrari wins the driver’s championship by having manipulated results, and Red Bull loses it by having their drivers battling until the end, then Ferrari’s example becomes harmful to the entire sport. As long as one team is pushing one driver to the front of the standings, others will feel pressure to do the same. That’s a disaster when you have a field this strong: Webber and Vettel at Red Bull, Hamilton and Button at McLaren, Alonso and Massa at Ferrari, and Rosberg and Schumacher at Mercedes (and God help us if Kubica gets a tough opponent over at Renault). This is the best F1 lineup in 20 years, and Ferrari cheats everyone if they force teams to push one driver. Am I a hypocrite in this matter? Certainly. I never complained when Schumacher was getting the same treatment at Ferrari. But it looked better on Schumacher. He was breaking records, drove like a master, and was completely barefaced about his willingness to break rules if it was to his advantage. But now, with a less dominant car and a less charismatic driver, Ferrari’s politics don’t look as good. Neither does Schumacher, to be quite honest. The same antics that were almost endearing from a championship leader seem petty and irresponsible from a driver hobbling around the middle of the pack like Schumacher is right now. His conduct toward Rubens is beneath contempt, for instance. F1 has changed. In Schumacher’s era, it was plucky Ferrari against the icy, machine-like McLaren team under Ron Dennis. Nobody else really mattered that much. The championship was always between two drivers, and it seemed fair for each team to rally behind its champion. But nowadays, Ferrari, Red Bull, McLaren, and Renault are all operating credible programs, and running some great drivers. In this environment, it’s simply less acceptable for a team to push one driver forward. As we head into the last race, I’ll be pulling for Mark Webber. By all accounts, he’s a class act. Admittedly, he has only himself to blame for his current predicament. He drives too aggressively and squandered his lead through mistakes. On the other hand, Vettel is even less admirable. His mistakes have been jaw-droppingly bad, and his conduct is off-putting in the extreme. When things are going well, he is all smiles and good humor. When things aren’t going well, he’s a hazard to other drivers and a waste for his team. Alonso… well, he had one win handed to him. His demeanor behind the wheel is annoying. He seems personally offended whenever someone does not yield position to him. But he is also a great driver who overcame a deficient car and some bad luck to get to the front of the pack. He is a two-time champion already and, if he adds a third to his count, it would be impossible to argue he doesn’t deserve it. I’ve been watching F1 for a while – probably being able to understand what I was seeing since about ’81. I’ve been bemused by the talk the past half decade. Team orders and #1 drivers were just always part of the deal as far as I was concerned. Ferrari took it too far I guess, leading to the recent situation. F1 is a team sport, even if fans are more interested in the driver’s championship. We don’t expect any other team in a team sport to sacrifice the team’s goals (having a driver’s champ and the #1 on the car next year) for an individual’s goals (being the one that is the champ). Regarding a couple items: I think Alonso was catching Massa and would have tried to pass him. I’d say he avoid the risk of doing this, more than having the victory handed to him, although I don’t have the timing data in hand so maybe I’m off base here. There is a good chart here that shows the intervals at the German GP. Vettel wasn’t closing on the Ferraris. However, Alonso had closed to within a second of Massa and I suspect you’re right that he would have tried to pass. But Ferrari never even let that come close to happening. This wasn’t a matter of one driver clearly being about to start attacking the other, and the team stepping in to avoid an incident. It was Alonso getting within shouting distance of Massa’s position and letting his team close the rest of gap. F1 as a team sport is a bit trickier. I think you’re absolutely right about what the team’s goals are, but it becomes difficult to square that with sportsmanship. Race wins matter a lot to drivers, and they matter to the fans who attend the races and watch them on TV. We want the individual GP to matter, not just as a stage in the season, but as an event in itself. So when you see the results of one race tweaked to better suit the team’s overarching goal for the season, it’s hard not to feel conflicted. At the same time, F1 has never just been about the racing. FIA politics and teams have always changed outcomes, and it always drives fans nuts. I myself don’t have a lot of patience for people who go on and on about “the show” and expect F1 to suddenly become a test of pure wheel-to-wheel skill. I guess I always look at F1 as a series of negotiations and compromises between the ideals and the realities. Ferrari are a bit too realist for my taste, in part because I think that fixation on the end results is bad for the sport as a whole.